ROMA – John Paul II seems to have recovered his health a bit. But not the Vatican curia. The men closest to the pope especially have sunk deeper into confusion. The protagonists of the latest mishap are the two men who most govern the pope’s public image: Archbishop Stanislaw Dziwisz (see photo), his personal secretary and deputy prefect of the pontifical household, and Opus Dei numerary Joaquín Navarro-Valls, the director of the Vatican press office. The stumbling block was Mel Gibson’s recent film on the passion of Christ. It is a film that has become the matter of international intrigue even before arriving in the theaters. 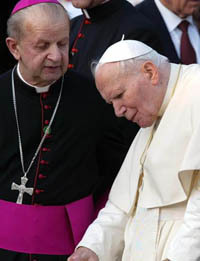 Dziwisz and Navarro had the idea of bringing pope Karol Wojtyla right into the middle of the quarrel. And when they sketched out a retreat, they created a disaster. They denied, both of them, that the pope had ever made the comment that the whole world heard from these very two. But let’s proceed in order. It was Friday evening, December 5, 2003, and in his dining room John Paul II, together with Dziwisz, watched a big-screen DVD of the first part of “The Passion.” The next day they watched the second part. And the following Monday, December 8, the feast of the Immaculate Conception, Dziwisz received the four who provided the preview to the pope. They were Steve McEveety, the film’s American producer, and his wife; Jan Michelini, director’s assistant to Mel Gibson, and his father Alberto, former anchorman of Tg 1 and a Forza Italia member of parliament. Both Michelinis are supernumeraries of Opus Dei. Jan was born, with his twin sister, in 1979, during the pope’s first visit to Poland, and upon returning to Rome it was Wojtyla himself who baptized him, the first of his pontificate. Since that time they have been very close, receiving many heavenly signs. During production, Jan Michelini was struck by lightning while was filming the crucifixion, and he was struck again on December 5, the day the pope previewed the film. On both occasions, he came away unharmed. The conversation took place in Italian. The Michelinis translated into English for McEveety and his wife what Dziwisz related from the pope. The key phrase is the following: “It is as it was.” Eleven letters to say that the film “is just like it happened in reality.” It’s enough to signal the pope’s total endorsement of “The Passion’s” adherence to the gospels. So what need was there to place the pope in the middle of this worldwide chorus of the film’s supporters that already counted curial prelates and bishops (the most lively being the Franciscan archbishop of Denver, Charles Chaput), battle-hardened movements like Opus Dei and the Legionaries of Christ (the agency Zenit falls among these), neoconservative authorities of the caliber of Michael Novak or “Crisis” editor Deal Hudson, neotraditionalist pressure groups like the Institute of Christ the King and High Priest, and continental Catholic networks like the agency “Aciprensa,” which covers all of Latin America? No; there was no need at all to bring John Paul II into the middle of this: this, at least, is what other Vatican officials think, especially in the secretariat of state. On December 24, Christmas Eve, Cindy Wooden of “Catholic News Service,” the news agency of the United States bishops’ conference, cited two anonymous prelates “close to the pope” who denied that he had made any judgment on the film. It was a madhouse. Jan Michelini reconfirmed his version. McEveety circulated an e-mail from Navarro telling him not to worry and to go ahead and use the pope’s fatal phrase “again and again and again.” Rod Dreher of the “Dallas Morning News” asked for further confirmation from Navarro, and he responded No, his messages to McEveety and others were never his own, they are fakes. But they all come from the same Vatican e-mail address, the same one from which the message disclaiming them was sent. On January 22, the director of the Vatican press office made an official press release: “It is the habit of the Holy Father not to express public judgments on artistic works.” But in private? One thing is certain: in public, the big lies have taken the stage.